Join Freddie the frog for fun, adventure and lively language learning through engaging stories, challenging songs, games, tongue twisters, and communication activities. 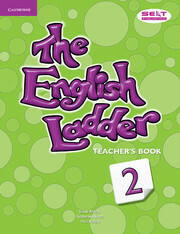 Part of a four-level course, this Level 2 Teacher's Book features lesson-by-lesson teaching notes, notes for activities in the Pupil's Book and Activity Book, tests for the end of each unit and each level, and clear guidance on language presentation. Playway to English Second edition is a new version of the popular four-level course for teaching English to young children.